Often referred to as the last Shangri-La, Bhutan offers the ultimate travel experience! Bhutan only opened its doors to tourism in 1974, and until recently limited the number of visitors allowed to enter each year. Now Beyond The Clouds is thrilled to offer a range of carefully planned tours to this magical destination. Experience the rich Buddhist culture, a stunning natural environment, well-preserved and unique traditions, and friendly local people while being led by an expert English-speaking Bhutanese guide. Our personalised Bhutan tours showcase the very best of Bhutan. Discover this mystical Land of the Thunder Dragon, where monasteries are part of the mainstream and traditional culture, architecture, and Buddhism thrive. Time your visit to coincide with a Tsechu, or festival, held annually in towns and villages throughout the kingdom. These spectacularly colourful and captivating events draws hundreds of Bhutanese people in a spirit of reverence, blessing, festivity and celebration. Festivals in Bhutan take place in Dzongs (monasteries) and come to life with spectacular colour, music, dance, and drama. Villagers gather to witness the incredible masked dances that depict traditional Bhutanese and Buddhist tales. Accommodation in Bhutan mirrors the serene natural environment that surrounds it - rustic and charming hotels blend modern conveniences with traditional architecture in a uniquely Bhutanese manner. You'll find your hotel in Bhutan comfortable but not luxurious by Western standards, providing an authentic experience in a beautiful but still developing country. Some luxury resorts have been established recently in Paro and Thimphu. All Beyond The Clouds guests receive a free upgrade in Paro; ask us about other upgrade hotel options. Combine the highlights of Bhutan with a festival or trek. Let us tailor-make a personalised Bhutan tour to suit your needs. Whether you’re traveling solo, as a couple, or in a group; whether you are interested in walking, trekking, festivals, or culture, the Beyond The Clouds team will be delighted to put together the perfect Bhutan itinerary! Discover the culture and drama of the magical kingdom of Bhutan with our Discover Bhutan Journeys, showcasing the best of Bhutan. Our unique Bhutan walking & trekking vacation options combine sightseeing with hiking through Bhutan's stunning landscapes. Sightseeing with a purpose - visit some of the most significant Buddhist sites in Bhutan, and experience the inspiring way dharma is interwoven into society’s fabric. Combine daily yoga with a qualified international yoga teacher and an inspired itinerary showcasing the best of Bhutan. Personalised itineraries to suit you. Create your own Bhutan holiday experience without being part of a tour group. We cater to solo travelers, whether it’s your first solo travel experience or you do it all the time! 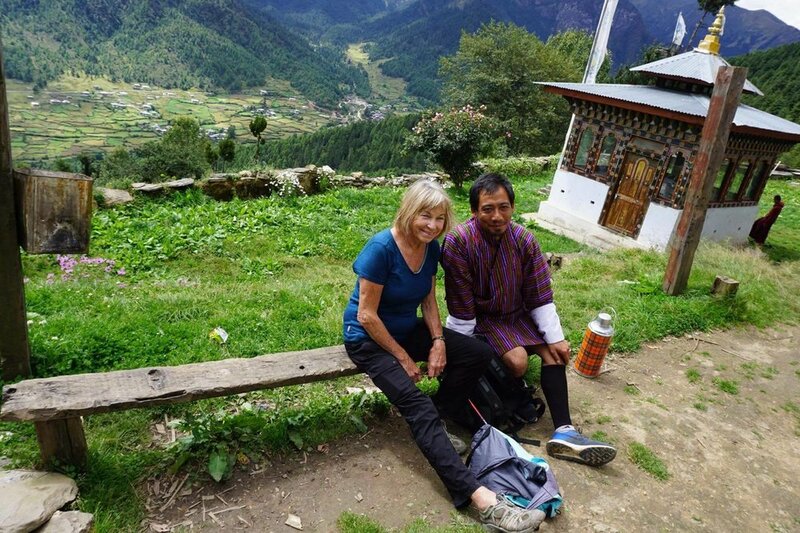 With experienced, English-speaking guides that we hand-pick, solo women or men can feel comfortable sightseeing or trekking alone with their guide in Bhutan.